A speculative (and oft-chided) premise in Western occultism is that tarot cards are living beings, that there is a spirit embodying each one. Each card is ascribed certain characteristics, tendencies of behavior, and qualities, just like any sentient creature. It’s subject to predictable habit, but also subject to spontaneity in any arbitrary moment. Modern day tarot readers dismiss that premise as superstition. I did, too. In the face of science and contemporary rationalism, animism—this belief that objects, such as a deck of cards, might possess an animated spirit essence—is ridiculed, even censured. To believe that a deck of cards can hold spirited life is to reveal an unsophisticated intellect. 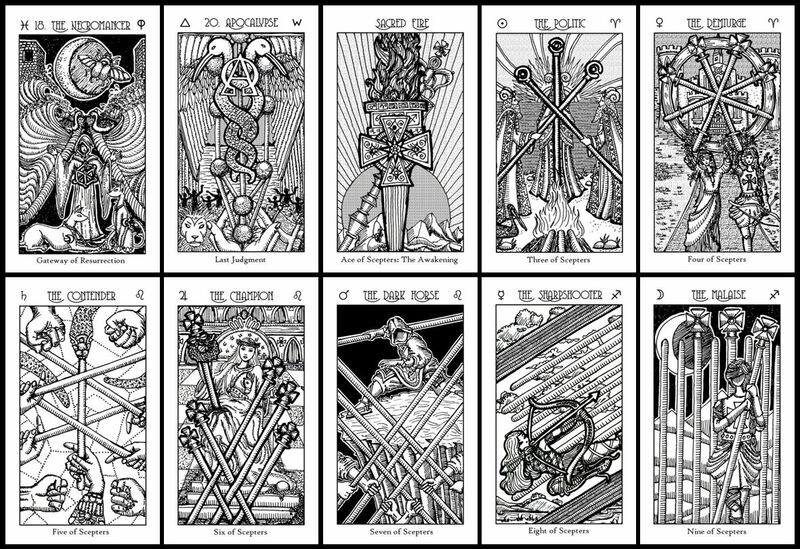 Yet that is exactly the point where I start my journey with crafting this tarot deck. What if there is a roster of known essential spirit energies in our universe that influences human events, both on the macroscopic and microscopic, and if encoded in just the right manner, a tarot deck (really, any intelligently designed system) can become much more than just pieces of cardstock? What if there really is a mad method to giving a tarot deck sentience? My ambition was to transform lines of ink and pieces of cardstock through a precise, formulaic code—an intelligent design—into a sentient roster of spirit calling cards. A tarot reader who wields such a roster would then become a spirit keeper. My ambition was to give life. I have set out to craft a tarot deck by a precise formula that can and will enliven every manifestation of that deck into living beings. That is the aspirational premise with which I begin the journey of creating the Spirit Keeper’s Tarot. Also, Crowley (and to be fair, others) noted that the Keys of the Major Arcana should be written with Roman numerals, not Arabic numerals. However, here I’ve opted to go with all Arabic numerals for numbering the Major Keys, in part as a tribute to Leonardo de Pisa (1175-1250), who is often credited for popularizing the Arabic numeral system in Europe. By the way, he’s better known as Fibonacci, the namesake for Fibonacci numbers forming the spiral sequence and a fundamental basis in sacred geometry. Considering a more global perspective, the Hindu-Arabic numeral system, historically, was used across a broader region of our world than the Roman numerals, and so in this seemingly minor, insignificant decision, I’m passively taking a very particular stand. 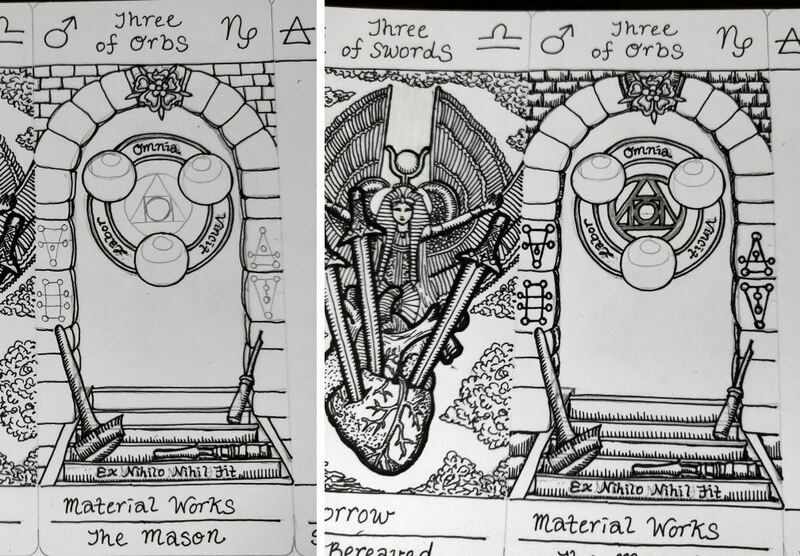 For each and every card, I referenced Waite’s Pictorial Key and Crowley’s Book of Thoth so that I would include their intentions for each card as best as I could, while still designing the cards in a way that expressed me. However, Waite and Crowley differed (and disagreed) significantly on the interpretation of many keys in the tarot, so harmonizing both approaches wasn’t always easy. I acknowledge that some of the resulting cards I’ve drawn might end up alienating both camps. Nonetheless, rudimentary knowledge of either the RWS or Thoth should be more than sufficient for operating Spirit Keeper’s Tarot. Apply your approach to tarot reading to the cards and go from there. The one segment of the deck that may cause confusion is the court cards. I’ve eliminated the “King of,” “Page of” titles, but instead, illustrated consistent patterns through each hierarchy so you’ll always know exactly what you’re looking at. Just remember that all Page cards feature the rook chess piece with a sealed envelope in the bottom right corner. All Knight cards feature the elemental in a septagon along with a horse. All Queens feature shields; and all Kings feature a magic square, and are titled “Archangel.” With those points in mind, proceed with the courts as you would with any other tarot deck. If, however, you seek to read the Empyrean Courts aligned with my original intentions as the deck creator, then in my approach, the court cards in Spirit Keeper’s Tarot always represent guardian spirits that are around the querent (which, admittedly, does require a certain degree of religious faith, and therefore can be omitted entirely from your practice if such faith is not there) and seeking to make their presence known. Ancestors can embody the courts. Deities can also embody the outline of the court card’s imagery, so they’re not always angels. (This applies to the Major Arcana cards as well—now and then deities might make their presence known through the Majors in a reading.) 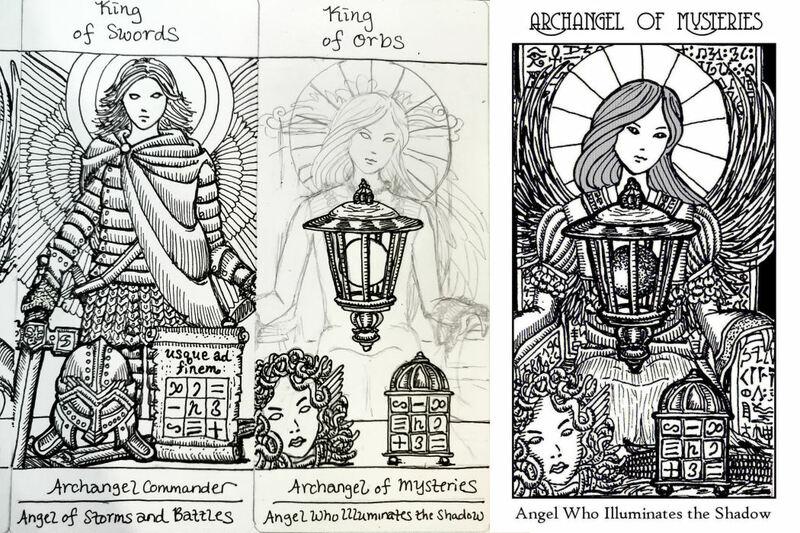 If you work with archangels, then the Kings are always the presence of archangels (or prominent gods or goddesses at the top of the hierarchy in their respective pantheons). I’ve also illustrated Spirit Keeper’s Tarot with the purpose of conveying esoteric knowledge and creating a comprehensive platform for divine transmissions. To that end, a deck such as this one requires intricacy of symbolism and allegory—each card is also designed to tell a story, to introduce you to a complete psychic realm, and to invite you to pathwork and journey into that realm. From the early Egyptian and Greek mystery traditions down the ages to Freemasonry and even in the reconstructionist mystery traditions of the modern era, the science of the occult traditions that the Seeker undertakes knowledge of are veiled in allegory. Symbolism encoded into rituals, the tradition’s religious iconography, religious and alchemical texts or grimoires, and parables are designed to instruct an Initiate on the tradition’s teachings. In other words, it is through imparting symbolism that esoteric and occult teachings take place, not in the literal transmission of ideas or practices. Pictorial keys, not spoken or written words, illuminate the mind’s darkness. The intricate or “busy” art styles of the medieval and Renaissance periods were deeply symbolic and intended to transmit esoteric knowledge. Alchemical texts are a classic example: illustrations of lions, eagles, serpents, eggs, etc. interacting with one another were symbolic of specific alchemical instructions and processes. The illustrations were by necessity intricate and detailed because a significant amount of instruction was being conveyed through that single leaf illustration. It is with that spirit that the Spirit Keeper’s Tarot is cast: to amplify a tarot reader’s psychic power through symbolism. 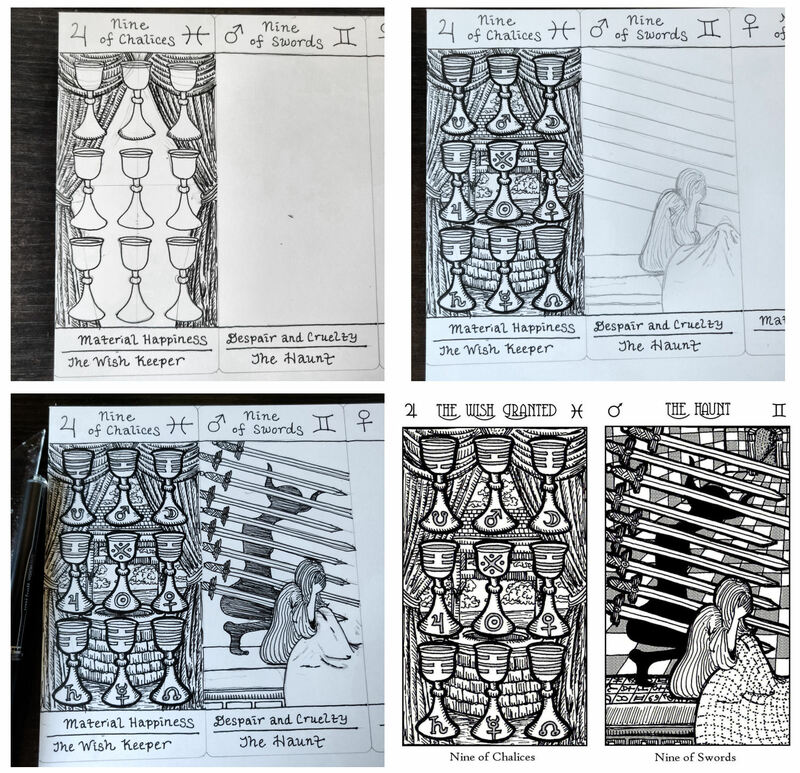 In the creation of The Spirit Keeper’s Tarot, I imposed stringent rules on myself: I completed the line drawings of the Major Arcana following the Fool’s Journey. I began with the first version of Key 0, which I renamed to The Initiate, because I began the creation of this deck as an initiate, with the intention that by the end of this journey, I would have become fully initiated into that point beyond the mountains. In the crafting of this deck, I found that though I began with Key 0, I also ended with Key 0, because after completing the New World Order, I produced a second Key 0: The Initiate. After completing the Minors in part, I produced yet another Key 0, this time one named The Seeker. When I completed the work, the final Key 0 I produced was named The Keeper. These three Key 0s in consecutive order convey my statement of purpose for Spirit Keeper. In Spirit Keeper, Keys 1 through 21 represent primordial spirits. They form the formless. Key 0 is the spirit of the Keeper, whether that Keeper comes to the tarot deck as the Initiate, the Seeker, or the realized Keeper. Thus, Key 0 will always be the significator card when using Spirit Keeper’s Tarot. There are three Key 0s to choose from: Key 0: The Initiate, for initiation into gaining access to the compendium of spirits the deck gives access to; Key 0: The Seeker, for divination; and Key 0: The Keeper, for communion and an interactive relationship with the spirits roster. After completing the Majors, I then proceeded with the lower realm of spirits, which begins with the set of Fours in the Minor Arcana. I go in the elemental order of Fire, Water, Air, and Earth (order in the Opening of the Four Worlds) or in terms of suit names, Scepters, Chalices, Swords, and Orbs. The order of the Minor Arcana cards in this Book is the order in which I completed each card. The lower realm is the world that has been formed. It is, by itself, removed and severed from the primordial spirits, and it is the upper realm that bridges the lower realm with the primordial spirits. The lower realm represents the mundane aspect. The upper realm, then, is the touch-down point from the primordial form of the formless. The upper realm designs the spiritual and metaphysical architecture that the lower realm is based upon. The upper realm consists of Aces to Threes, and then the four court sets, or the Holy Guardians. As I had done for the lower realm, in the upper realm, I followed the elemental order of Fire, Water, Air, and Earth, rendering each card from the set in the order of Scepters, Chalices, Swords, and Orbs. 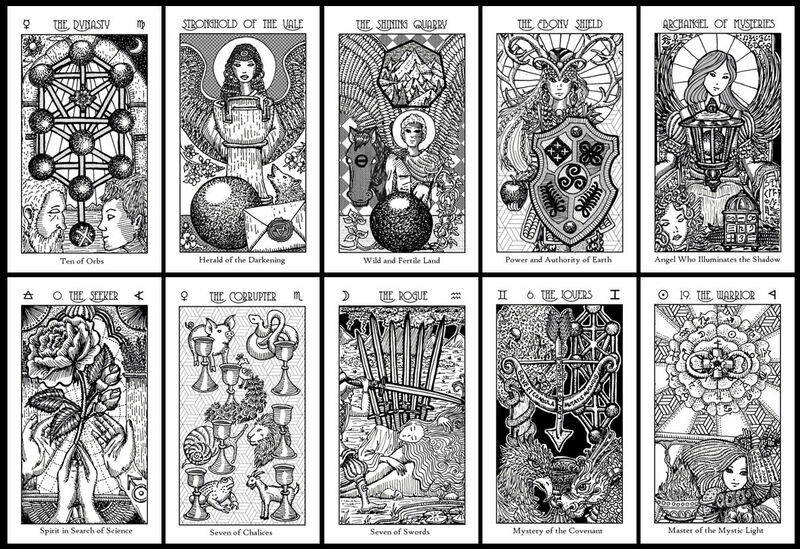 The artistic style of Spirit Keeper’s Tarot is rendered in the spirit of Renaissance humanism (circa the 14th, 15th, and 16th centuries), a time when Christian mysticism and paganism merged. 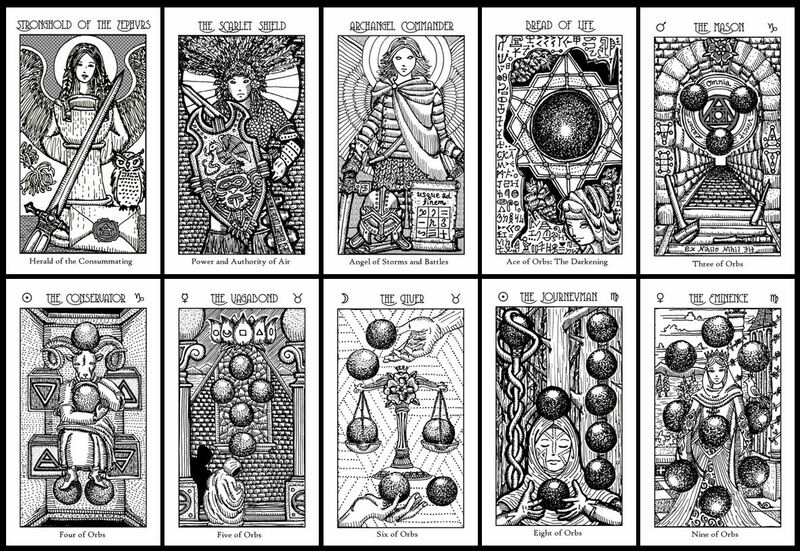 Thus, Hermeticism, traditional Western astrology, Platonic philosophy, alchemy, and the Kabbalah are the heavy-hitting influences over the imagery of this deck. The historic art styles that inspired Spirit Keeper were in turn inspired by Byzantine, Islamic, Viking, Carolingian, Celtic, Romanesque, and Gothic art styles, so those were the classic works of art I studied and referenced while drawing Spirit Keeper’s Tarot. I tried to simulate medieval woodblock print art. All art in this deck are original pen and ink works hand-drawn by me, and not taken from actual historic woodblock prints. My only tools for drawing these cards were pencil, pen, straight edge, compass, and protractor. Left: frontispiece from Der längst Gewäschte und Versprochene (1746) by Herman Fictuld. Right: my own illustration printed in the interior of the deck box. There are, of course, instances where what I’ve drawn was heavily influenced by an existing historic woodblock print, but this is not a digitally cut and paste or multi-media collage deck. I did not draw these illustrations digitally on a tablet where I could simply hit the “undo” button when I made a line error. The artwork was done—as best as I could manage it—in the spirit of a Renaissance artist producing a hand-crafted tarot deck. 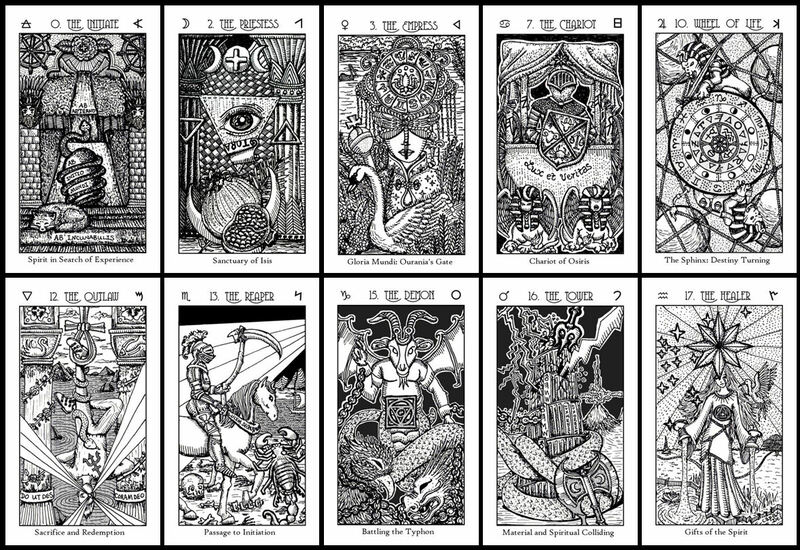 Each and every illustration was drawn at actual tarot card size, so each original pen and ink drawing is approximately 7 cm x 12 cm, with the full card itself, including the handwritten captions, at approximately 7 cm x 16 cm. Also, for the primordial realm of the Major Arcana, I wanted to make sure patterns could be observed in Keys with familial relations. When I say familial relations between the Keys, I mean they parallel one another within the path of the Three Septenaries, by numerology, or by astrology. Thus, Key 1, the first milestone in the First Septenary, would need to share a noticeable common trait with Key 8, the first milestone in the Second Septenary, and with Key 15, the first milestone of the Third Septenary. For Keys 1, 8, and 15 (the first column above), it’s the coiled serpent, appearing as a double ouroboros for Keys 1 and 8, and forming as the tail of the Demon, manifesting as a typhon. With Keys 2, 9, and 16, it’s the Eyes of God for Keys 2 and 9, and then an Act of God for Key 16 (also, the God’s Eye formed by the fumes from the volcano and the two moon blocks suggesting the union of both Eyes for prophesy). There’s also the staff resembling a thunderbolt in Key 9 and a thunderbolt resembling a staff in Key 16. In other familial sets, such as Keys 3, 10, and 17, or the set of Keys 4, 11, and 18, the common trait to be found is in the shape or configuration of objects in the card. In Keys 7, 14, and 21, it’s in depicting the astrological modes: the shield on Key 7 depicts the cardinal signs; the sash in Key 14 depicts the mutable signs; and the four corners of Key 21 depict the fixed signs of the zodiac. Thus, septenary patterns should emerge among the keys both laterally and vertically. For instance, Key 12 depicts the dying god, with light directing toward Key 13, the mystic death, with light directing it from Key 14, the Holy Guardian Angel. Patterns of common traits should also emerge among Keys with numerological relations. For instance, both the swan and pelican allusions appear in Keys 3 and 12, and then there is the messianic figure appearing in Key 21. Consider the twin pillar motif connecting Keys 2, 11, and 20, or depictions of zodiac constellations for Keys 8 and 17. Other times, linking traits were subtler, and I worked with concepts rather than draw the patterns too literally. When you examine the tarot architecture through these familial relations, the cohesiveness of that architecture will impress you. For instance, in terms of numerological relations, only the 1s, 2s, 3s, and 4s, are families of three cards while the 5s through 9s each only have two. 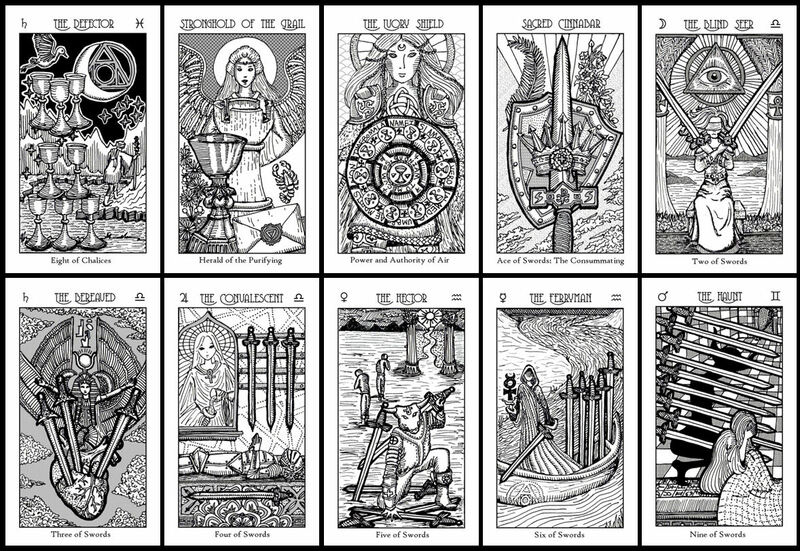 The families of three correspond with the transition points between realms in the Minor Arcana (between the Seven Lower Realms and the Seven Upper Realms). The primordial family of 4s link the Self (Key 0) to the spiritual plane, and also the touchdown point between Heaven and Earth with the Realm of Fours in the Lower Realm. The primordial family of 1s link the Aces and the Tens, where the Realm of Tens is a mounting point into the Upper Realms. Otherwise, the remainder Lower Realm sets all only link to primordial families of two, born of a primordial yin and a primordial yang. All Upper Realm sets (Aces to Threes) are linked to a primordial family of three. Also, per the Sepher Yetzirah, or The Book of Creation, a text on Jewish esotericism, the 5s correspond with what is Above, and here we see The Angel in the family of 5s. The 6s correspond with what is Below, sealed in the Deep, where we find The Demon. I’ve designed each family of cards, whether it’s familial by the septenaries, numerology, or astrology, to tell their own story, to have a shared voice. Each Key speaks for itself and yet at the same time, is also part of a collective voice as well. The astrological families in the Major Arcana also correspond with the characters of the letters in the Hebrew alphabet, per the Sepher Yetzirah. The three mother letters are the foundation and beginning of beginnings, where we find the Apocalypse, The Outlaw, and The Initiate/Seeker/Keeper. These three cards also correspond to Fire, Water, and Air respectively. They beget the seven double letters, which also correspond to the planetary Sacred Seven. The double letters are the foundations of materialized essences that come in a light-dark dichotomy. For instance, Key 1: The Magus exemplifies the primordial dichotomy of Life vs. Death; Key 2: The Priestess is Peace vs. War; etc. These correspondences will be provided in their respective card entries under the line “Sepher Yetzirah” for Keys 1, 2, 3, 10, 16, 19, and 21. Then come the single letters, which correspond with the twelve zodiac signs with Key correspondences as noted in the previous table. The table of astrological families shows the relations. All Keys below Key 20 are relatives of that Key. Thus, even though the sign Scorpio is elementally Water, with its ruling planet as Mars, Scorpio is different from the rest of its Water siblings—a bit like the black sheep of the Water family in the zodiac—because it tends to exhibit Fire qualities despite being a Water sign. Likewise, you may note that Virgo (Key 9) is an Earth sign, and yet it tends to exhibit the qualities of Air. As siblings, Taurus and Capricorn tend to be closer to each other in qualities than either one is to Virgo, whereas despite having a distant kinship, Virgo shares many qualities with Gemini. I mention all this in the Design Statement because I’ve designed Spirit Keeper’s Tarot to exhibit cognizance of these familial relations so that the mindful tarot reader will be able to spot the patterns in a spread and more keenly hear the Voice of God through the cards. Speaking of God, I came in to this project with the conviction that there is a God, though my personal experience of that God is far removed from how God is often expressed in dominant religious doctrine. Through my physical senses, as this single cell, I can’t sense very far and therefore might not comprehend what type of tissue I’m part of, let alone what organ system or greater function I serve. It’s through the psychic sense that I stand any chance of determining my larger role in the machine of the body and, using religious terms, how I serve that God, that mind and soul of the body. Divination, such as tarot, is a tool that helps to amplify that psychic sense. I speculate that the reason that socialized religious establishments might be against divination (and, extrapolating upon that, why of the senses we humans possess, that so-called sixth sense did not evolve in the majority of the population the way sight, hearing, smell, etc. did) is because divinatory insight empowers that mere cell with independent far-sighted intelligence, and that form of far-sighted full-context intelligence can be dangerous when influenced by the Devil. When I say Devil, again my experience of it is removed from popular religious notions. I experience the Devil as an inherent, embedded impulse within the machine of the body that desires to sabotage that body (and through the body, sabotage the soul) by destroying what is good, to ruin that God, and to do so, begin by destroying the God within each of us single cells so that, one by one, the physical pieces of that God can be annihilated. We all know the Devil and have felt the sway of that influence—that compelling desire within us to sabotage the good others possess, and the good in ourselves. We carry out the Devil’s work when we acknowledge something good in this world, whether that’s someone else enjoying success, enjoying beauty or happiness, and after that acknowledgement, we get that dark impulse from within desiring to destroy it. That unshakable impulse to wipe the genuine smile off someone’s face or to thwart someone’s happiness, to undermine success, is the Devil at work. It’s also self-sabotage—when we get that dark impulse to destroy even what’s good within us, to destroy the good we’ve come to enjoy, to sabotage the good in our own lives. For instance, I believe that those driven to suicide are pushed there by the Devil, because these are individual cells who fundamentally possess an inordinate, extraordinary Light, an innate good that is threatening, and so from inception, from the very moment the Devil has identified this threat of Light and good, efforts are put forth to eliminate it—to drive that Light to eliminate itself. 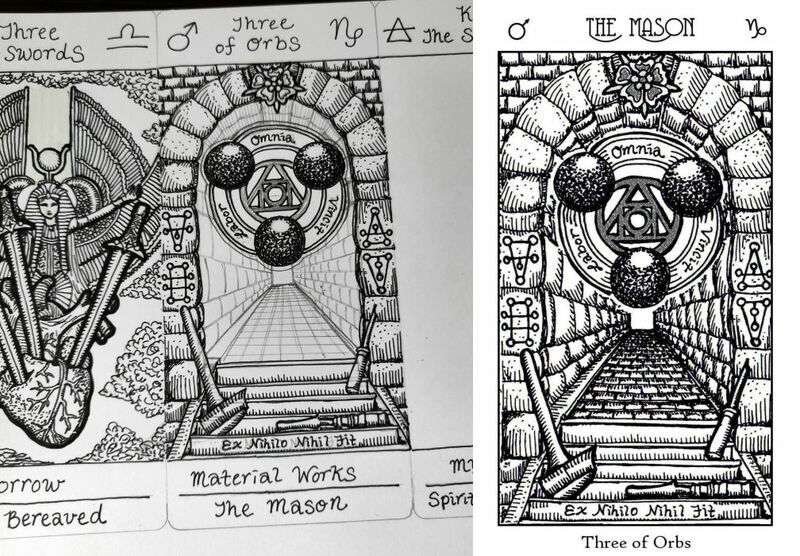 The Holy Trinity is another recurring topic I explored in illustrating these cards. Beyond Father, Son, and Holy Ghost as a motif, this is the structure of every Initiate’s path, no matter the tradition: to understand Man, then to understand the Universe, and finally, to understand God, or the Divine (i.e., Homo, Rota, and Deus). In Eastern tradition, this is the Holy Trinity of Man, Earth, and Heaven, which is reflected in the Hermetic Trinity (“First, God; Secondly, the World; Thirdly, Man,” from Corpus Hermetica). This is also the Trimūrti of creation, maintenance, and destruction—Brahma, Vishnu, and Shiva—and how the three can form a Union Incarnate, a three-headed avatar, Dattatreya. The Trinitarian Principle will also be expressed through the mythology of Osiris, Isis, and Horus. It is the Tria Prima, or ingredients for the Bread of Life. In Tarot of the Bohemians, Papus quotes Hesiod: “I feel that hidden beneath this mystical formula of the Trinity is one of the most important scientific laws that man has ever discovered.” And so on the spiritual quest, Key 0: The Seeker is the Spirit in Search of Science. My ambition for the Spirit Keeper’s Tarot and its companion Book of Maps is to go beyond any ordinary tarot deck. 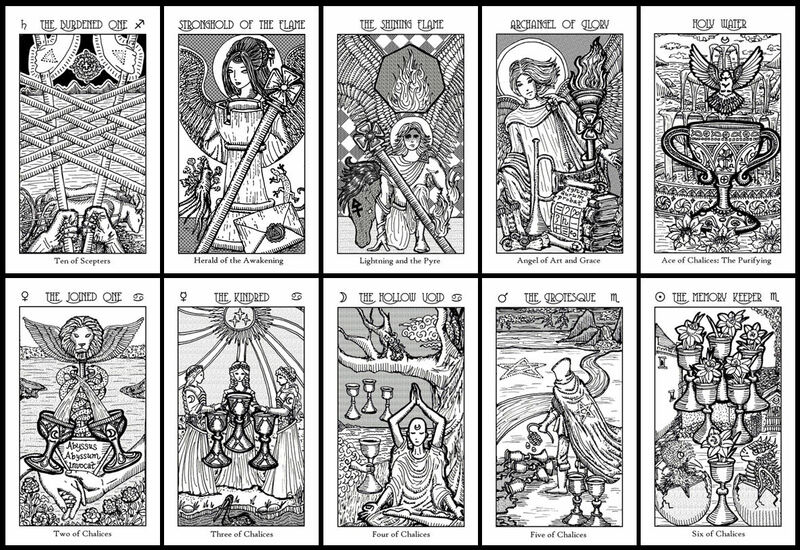 First, transmitted through symbolism, the Major Arcana cards are designed to reveal to you your Holy Guardian Angel and to enable direct communion with your Angel. Through an Initiation process, you’ll gain access to a direct line and will be able to use a very precise pictorial string of keys (like a telephone number or the unique series of numbers for an IP address) to commune with your Angel. Second, as a direct line to beneficent immortals, the deck facilitates divination where the process isn’t “what happens, happens” as it can often be when intentions are not set with precision, but rather, it’s divining by presenting your inquiries to those beneficent immortals. Finally, it’s a deck crafted to be a grimoire, enabling more efficient spirit petitions and spell-casting, and specifically, with the roster of spirits named in these cards. This is a book of changes intended to transmit the Divine Word to each individual, words transmitted to us by our higher angels. In sum, the purpose of the Spirit Keeper’s Tarot is for you to read from its pages (the cards in the unique arrangements of spreads you cast) messages direct from the divine realms and to connect with the archetypes of deity that are most prominent in the genetics of your astral spirit. The purpose is to guide every Initiate to become the Seeker, every Seeker to become the Keeper, and every Keeper to be both The Magus and The Priestess, with a reverent, profound, True, and deeply personal direct connection to the Divine, to the Holy, the Sacred, and through a collective empowerment, led by the charge of each one’s inner divine genius, progress toward a beneficent New World Order.